Chinese President Xi Jinping raises his hand to show approval of a work report during the closing ceremony for the 19th Party Congress at the Great Hall of the People in Beijing, China (Oct. 24, 2017). 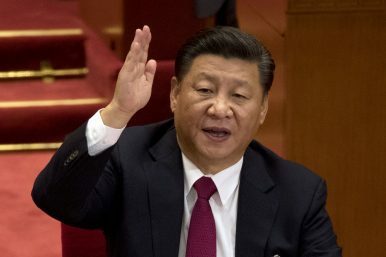 In a 3.5 hour marathon speech at the Chinese Communist Party’s 19th National Congress on October 18, President Xi Jinping heralded the dawn of a “new era of socialism with Chinese characteristics.” By adding the words “new era,” Xi differentiated his policies from former leaders’. The idea of “socialism with Chinese characteristics” was one of the most remarkable creations of Deng Xiaoping. Deng, by adopting a market economy to China’s own condition, successfully achieved unprecedented economic success. Now Xi signals a modified application of Deng’s policies for China’s “new era.” How does Xi Jinping Thought compare with Deng Xiaoping Theory? First, Xi will pursue more balanced economic growth. Deng Xiaoping put forward the idea of “early and common prosperity,” meaning “prosperity for some [in the short term] so as to achieve prosperity for all [in the long term].” Opening the door to uneven development, Deng’s policies focused mainly on coastal regions in the east. In turn, the coastal regions transformed into today’s major cities and enjoyed a massive FDI influx. Yet, Deng’s approach also caused phenomenal economic inequality illustrated by China’s Gini coefficient, which has been as high as 0.465 (closer to 1 mean less equal). In recognition of this, Xi reiterated the significance of balanced economic growth. “To achieve the goal of a “moderately prosperous society” by 2020 and to accomplish the “great rejuvenation of the Chinese nation,” he will promote more balanced economic growth with a special focus on long-marginalized regions in western and central China. Second, Xi’s China will promote industrial innovation in an active way. During the Deng era, China’s growth was heavily reliant on producing inexpensive but low-quality commodities based on cheap labor. This strategy will continue to some extent, but at the same time China will also actively promote industrial innovation. In his speech, Xi repeatedly emphasized the need for economic reforms and innovation to bolster the economy. “Innovation is the primary force driving development, and the strategic foundation for building a modern society,” Xi stressed. He will further open China’s door to international society and lower Chinese barriers for foreign investors, while strengthening domestic innovative capabilities in digital, engineering, genetic, aerospace, cyberspace, and smart technologies. Third, Xi will stress the rule of law during his second term. Rules were applied somewhat arbitrarily during the Deng era, and such practices have continued until today. Xi announced his aim to break this long tradition, by establishing a “central leading group for full rule of law.” He will persist in a fierce anti-corruption campaign, while attempting to instill the rule of law in China. Yet, considering that he concurrently stressed the leading role of the Communist Party, including over the legal system, his version of rule of law is different from Western concepts. Instead, it may be described as the “rule of law with Chinese characteristics,” in which the Communist Party serves as a main enforcer of the law, and challenging Party authority will never be tolerated. Finally, China under Xi will actively participate in international affairs. Deng Xiaoping left a maxim that has underpinned China’s foreign strategy ever since: “taoguang yanghui,” meaning “keep a low profile and bide your time.” Deng also said, “By no means should China take the lead.” Nevertheless, Xi appears convinced that China has bided enough time now. During the Party Congress, he stated that an amicable external environment has been shaped during the last five years, and that China will take an active role as “constructor of global peace, a contributor to development of global governance, and a protector of international order.” We will witness China’s more active participation with a louder voice in international society during Xi’s second term. The Deng Xiaoping era is officially over; Xi’s “new era” has begun for China and the world.